Hameedia, Sri Lanka’s leading menswear specialist, recently stepped forward as the Official Clothing Partner of the National Youth Model United Nations (NYMUN) 2018. 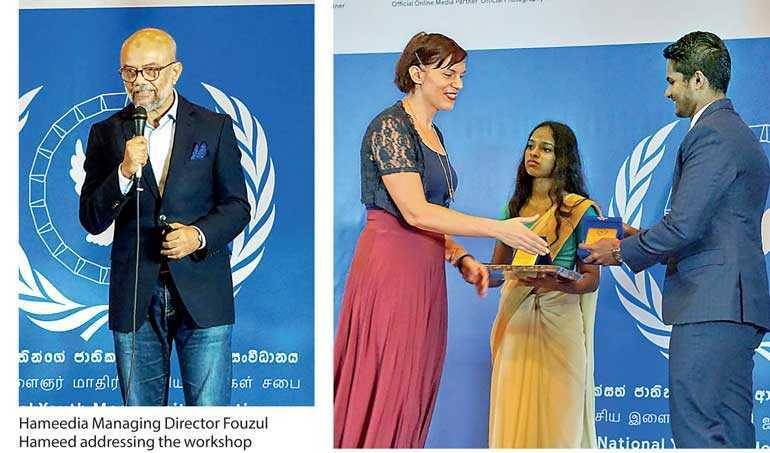 In an effort to empower the nation’s younger generations, Hameedia hosted personal development and grooming sessions at each provincial workshops as well as the final workshop which held on 29 and 30 September at University of Colombo. Conducted in the run-up to the two-day NYMUN conference, the series of workshops will draw young people from all walks of life and every corner of the island. Hameedia delivered an array of dynamic and insightful personal development sessions, where participants coached on important life skills such as developing their personality and character, grooming and dressing smartly. Through these interactive sessions, Hameedia also aims to mentor Sri Lankan youth led, giving them the encouragement that they need to be proactive citizens whom well-equipped to face and overcome challenges in their daily lives. Taking its passion for nurturing young talent one-step further, Hameedia will also be launching a comprehensive six-month internship program specifically for students, school-leavers and undergraduates in the near future. Hameedia Managing Director Fouzul Hameed attended the opening ceremony as the Guest of Honor and Transparency International Sri Lanka Executive Director Asoka Obeyesekere as the Chief Guest and United Nations Sri Lanka Office of the Resident Coordinator Head of Office Sandro Aslund as the Guest of Honour participated in the third National Youth Model United Nations conference. Model United Nations, also known as Model UN or MUN, is an educational simulation and/or academic activity where students can learn about diplomacy, international relations and the United Nations. MUN involves and teaches participants speaking, debating and writing skills, whilst also instilling critical thinking, teamwork and leadership qualities. Usually conducted as an extra-curricular activity, some schools also offer Model UN as a class, with the aim of engaging students and allowing them to develop a deeper understanding of current affairs and world issues. NYMUN is a two-day conference that functions as a national simulation of the United Nations and its affiliated organisations, for youth aged 14-30 in Sri Lanka. Now in its third installation, this year’s NYMUN event will include an additional component of eight provincial workshops which will focus on creating awareness about the work undertaken by the UN and its various bodies, prior to the final two-day conference. Established in 1949, and with nearly 70 years of experience, Hameedia has grown to become a pioneer in the Sri Lankan retail fashion industry. The fashion store is renowned for delivering high quality custom tailoring under the bespoke category as well as ready-made clothes for gentlemen. The Hameedia, multi-brand retail stores house a collection of quality menswear brands such as Le Bond, Envoy London, Signature and Adidas, to name a few. Hameedia also prides itself on offering outstanding standards of service to ensure that all clients enjoy a shopping experience that is positive and personalised. With a network of over 30 outlets across Sri Lanka and a large and experienced team, Hameedia has a strong local presence and has also extended its operations to the global fashion industry.